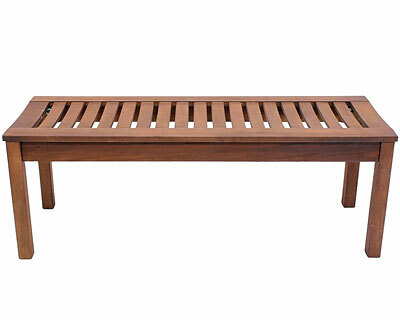 Turn any section of your patio or garden into a convenient sitting area with the Achla Wooden Backless Bench. This streamlined piece provides a generous resting spot, and its backless design allows for a myriad of placement options. The hardwood frame spans 48", and a wealth of slats creates the comfortable seat. The four legs elevate the bench to 16.5", a wonderful chair height, and can rest on a level surface in your home, on your deck, or in the garden. The tan color with red undertones furthers the bench's natural appeal, and the item is crafted from sustainably harvested hardwood for an environmentally friendly piece. Offer seating to a few friends in your garden on this Wooden Backless Bench. Some assembly required.